The test Samsung UN43NU6900FXZA vs LG 43UJ6300 was proceeded to compare low-cost Samsung of NU6900 series (2018) and high-end LG of UJ630 series (2017). They have the same screen size, resolution, and a set of built-in video-file codecs. However, they have some essential differences. LG 43UJ6300 vs Samsung UN43NU6900FXZA has demonstrated the peculiarities of their display type - LG 43UJ6300’s IPS matrix with its wide viewing angle versus Samsung UN43NU6900FXZA’s VA display and its fading picture quality at an angle. Both TVs have no local dimming to enhance colors’ accuracy. LG 43UJ6300 permits to stream amazing-quality 4K content. It has a decent contrast ratio to produce a perfect picture in a light room and an average one in a dark room (blacks look a bit gray there). Samsung UN43NU6900FXZA’s contrast ratio is better, but the lack of colors gives some glare in a bright room. Both TVs have a semi-gloss finish, but LG 43UJ6300 is better in handling direct reflection. Those two units can upscale low-resolution content (480p) without any obvious issues. Both TVs have the same speakers’ power that can be enhanced via soundbar. Samsung UN43NU6900FXZA is not compatible with Bluetooth to connect mobile devices wirelessly in contrast to LG 43UJ6300. However, it supports more streaming services. 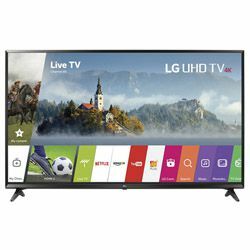 LG 43UJ6300 includes the TruMotion tech that is remarkable for its twice higher real refresh rate than Samsung UN43NU6900FXZA’s Motion Rate to provide more natural-looking motion. Besides, LG 43UJ6300 has a more advanced direct LED backlight to produce more uniform blacks. Samsung UN43NU6900FXZA lacks the number of inputs that force you to buy the additional HDMI switch to connect more units. LG 43UJ6300 has a sturdy building despite the plastic elements. Its stands are plastic as well bit supports TV well. The TV has some inputs on the back that can complicate the access to them in case of wall mounting. The TV and its borders are rather thick. Samsung UN43NU6900FXZA is thin, but its gloss-finished borders and bezel are thick. The inputs are on the side of the TV. The speakers sound crisp and clear with the Optimized Sound mode. The picture is superb when playing games on PS4 Pro. The TV is loaded with ads right on the home screen. No RCA input to use older equipment. Digital recording that makes it unnecessary to connect DVR. Incredible low input lag to please any gamer. Energy Saver mode helps save energy through picture quality. The interface can get a little slow.